All the bullets in the world mean nothing if your concealed carry handgun fails when you need it most. 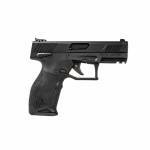 The XD-S Mod.2® in 9mm is a less than one-inch wide pinnacle of reliability. 25K rounds without a stoppage and an integral grip safety for total peace of mind when carrying. Caliber 9mm Recoil System - Dual Captive Recoil Spring w/ Full Length Guide Rod Sights - Fiber Optic Front, Tactical Rack Rear Weight (with Empty Magazine) - 21.5 oz Height - 4.3" w/ Flush Magazine, 4.85" w..
All the bullets in the world mean nothing if your concealed carry handgun fails when you need it most. The XD-S Mod.2® in 9mm is a less than one-inch wide pinnacle of reliability. 25K rounds without a stoppage and an integral grip safety for total peace of mind when carrying. Caliber 9mm Recoil System - Dual Captive Recoil Spring w/ Full Length Guide Rod Sights - Tritium Night Sights Weight (with Empty Magazine) - 21.5 oz Height - 4.3" w/ Flush Magazine, 4.85" w/ Extended Mag .. The Taurus Judge Magnum can chamber both .410 gauge 2.5" or 3" shotshells and 45 Colt ammunition, ideal for short distances where most altercations occur, or longer distances with the 45 Colt ammo. Taurus has finely tuned the rifling to spread the shot pattern at close quarters or to guide the .45 caliber bullet to the target. It is available with a 3" or 6.5" barrel in a blued or stainless steel finish. Action :Single/Double Caliber :410/45..
Taurus 45/410 Judge Tracker Magnum Stainless Steel Revolver. The Taurus Judge Magnum can chamber both .410 gauge 2.5" or 3" shotshells and 45 Colt ammunition, ideal for short distances where most altercations occur, or longer distances with the 45 Colt ammo. Taurus has finely tuned the rifling to spread the shot pattern at close quarters or to guide the .45 caliber bullet to the target. 3" barrel in a stainless steel finish. Action :Single/Double Caliber :410/45 ..
Taurus' 856 is ideal on-body or off-body carry, and home defense usage. It features soft rubber grips, while the double/single action increases speed and accuracy for follow-up shots. The 856 also has serrated ramp front/fixed rear sights and a transfer bar safety. This model has a 2" carbon steel barrel and matte black metal finish. 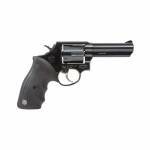 Finish: Matte Black Caliber: 38 Special Grips: Soft Rubber Capacity: 6 Weight: 22 oz Barrel Length: 2" Act.. 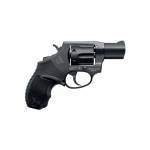 The Ultra Lite Taurus 856 is a reliable 6-shot, 38 Special revolver that features soft rubber grips—making it comfortable to shoot at the range while the double/single action increases speed and accuracy for follow-up shots. The 856 is offered in either a Matte Blue or Matte Stainless finish. Known for its easily managed recoil impulse, the .38 Special round of the 856 can accommodate ammunition ranging from light target loads to self-defense rounds. The DA/SA action and 2-inch barrel on the 856..
TAURUS INTERNATIONAL Judge Taurus 2441031T Judge 410/45LC 3" 5rd Fiber Optic Sight Ribber Grip Overlay Blue Single/Double action revolver in a 410/45 Long Colt caliber with a 3" or 6.5" barrel, featuring a Taurus Security System safety, Fiber Optic sights, Ribber Grip Overlay grips, Blue finish, 5 rd capacity and weighing approximately 29 oz. 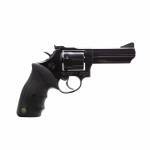 SPECIFICATIONS: Mfg Item Num: 2441031T Category: REVOLVERS Type :..
With its lightweight 22 oz. polymer frame, thin profile, and ramped 3.2 inch barrel, the newly re-designed Millennium G2C is the ideal concealed carry handgun. The Millennium G2C features an accessory rail, high-profile sights, an aggressive, textured grip and melted edges for added comfort and easy concealment. Model G2C Finish: Cyan / Stainless Caliber: 9 mm Capacity: 12 +1 Weight: 22 oz. Barrel Length: 3.2" Frame: Compact Action: SA/DA Front Sight: Fixed Length: 6.24" ..
With its lightweight 22 oz. polymer frame, thin profile, and ramped 3.2 inch barrel, the newly re-designed Millennium G2C is the ideal concealed carry handgun. The Millennium G2C features an accessory rail, high-profile sights, an aggressive, textured grip and melted edges for added comfort and easy concealment. Model G2C Finish: Blue Caliber: 9 mm Capacity: 12 +1 Weight: 22 oz. 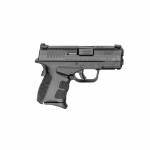 Barrel Length: 3.2" Frame: Compact Action: SA/DA Front Sight: Fixed Length: 6.24" Safety: Lo.. These revolvers are a longtime favorite of security personnel and perfect for Homeland Defense Forces. 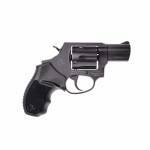 With a choice of .38 Special +P (Model 82) or .357 Magnum (Model 65), this medium frame, 6-shot revolver features comfortable rubber grips and a deep, lustrous finish. With fixed sights and a custom Single Action/Double Action trigger for improved accuracy and speed, the 65 and 82 are the perfect partners for whatever trouble lurks around the corner. For even more firepower, the Model 66 steps .. 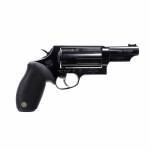 The .357 Magnums have comfortable rubber grips and deep, lustrous finishes. The Model 66 has adjustable target sights and a seven shot cylinder. Available in matte stainless steel or blue steel with 4" or 6" full underlug barrels, all carry the Taurus Security System and unlimited lifetime repair policy. 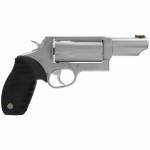 Finish: Blue Steel Caliber: .357 Mag Grips: Rubber Grip Capacity: 7 Weight: 38 oz. Barrel Length: 4" Action: DA/SA .. 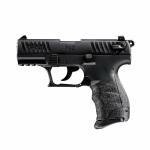 The TX22, from Taurus, is the most advanced 22LR pistol on the market. Engineered to deliver best-in-class accuracy and reliability, this rimfire polymer sporting pistol shoots and feels every bit like a custom-tuned competition model-without any costly upgrades or modifications. From the short, smooth pull of its precision-designed Taurus Pittman Trigger System (PTS) to the built-in comfort of its ergonomic grip, the TX22 is one performance-driven full size that's ready to race. Right out of th..
A feature-rich, bolt-action rifle at an affordable price point, the T/C Compass elegantly blends American-made craftsmanship and value into a professional-grade rifle. The aluminum pillar bedding system positively locates the receiver for outstanding accuracy. It features a three-lug bolt design with a 60 degree lift for good scope clearance and a smooth, easy cycling action. The single-stage, adjustable trigger offers a crisp release for precision shooting, and the 3-position safety (with bolt ..
Tikka T3 Lite Blued .270 WIN 22-7/16" Barrel 1:10 Twist Bolt Action Rifle. Blued Barrel and all-black polymer stock. High performance combined with lightweight ease. Single stage trigger, with adjustable pull 2-4lbs. Right Hand Bolt Action 270 WIN 3+1 Two Stage Safety Barrel Length: 22-7/16" Rate of Twist: 10" .. 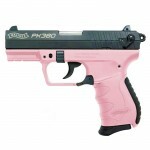 The PK380 Pink is not just good looking. It is small and good looking. 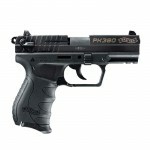 That makes the PK380 excellent for concealed carry. Its small grip is ideal for female shooters with small hands. The slide is easy to operate, making it a good choice for women. The light weight goes unnoticed in a pocket or purse. 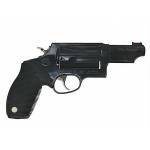 Action :Single Caliber :380 Automatic Colt Pistol (ACP) Barrel Length :3.66" Capacity :8+1 Safety :Lever Grips : .. The PK380 is not just good looking. It is small and good looking. That makes the PK380 excellent for concealed carry. Its small grip is ideal for shooters with small hands. The slide is easy to operate, making it a good choice for women. The light weight goes unnoticed in a pocket or purse. 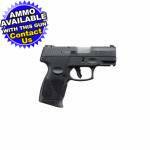 SPECIFICATIONS: Mfg Item Num: 5050308 Category: PISTOLS Type :Pistol Action :Single Caliber :380 Automatic C.. This model includes a decocking safety and interchangeable backstraps. The Walther P22 QD with its egronomic design and smiple operation makes it a fun pistol for plinking and informal target shooting. The P22 QD operates with an external hammer and a double-, single-action (DA/SA) trigger; a thumb safety blocks the firing pin and also decocks the pistol for safe unloading of the chamber. An additional safety prevents the pistol from firing if dropped. The frame is constructed of tough polymer w..